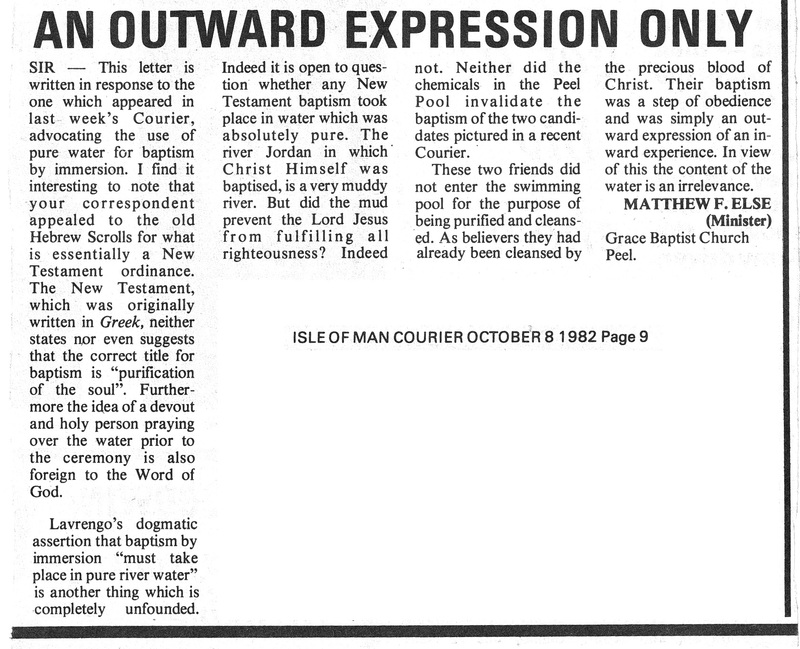 A letter to the editor written by Matthew Else and published in the "Isle of Man Courier" 8th October 1982 . SIR — This letter is written in response to the one which appeared in last week's Courier, advocating the use of pure water for baptism by immersion. I find it interesting to note that your correspondent appealed to the old Hebrew Scrolls for what is essentially a New Testament ordinance. The New Testament, which was originally written in Greek, neither states nor even suggests that the correct title for baptism is "purification of the soul". Furthermore the idea of a devout and holy person praying over the water prior to the ceremony is also foreign to the Word of God. Lavrengo's dogmatic assertion that baptism by immersion "must take place in pure river water" is another thing which is completely unfounded. Indeed it is open to question whether any New Testament baptism took place in water which was absolutely pure. The river Jordan in which Christ Himself was baptised, is a very muddy river. But did the mud prevent the Lord Jesus from fulfilling all righteousness? Indeed not. Neither did the chemicals in the Peel Pool invalidate the baptism of the two candidates pictured in a recent Courier. These two friends did not enter the swimming pool for the purpose of being purified and cleansed. As believers they had already been cleansed by the precious blood of Christ. Their baptism was a step of obedience and was simply an outward expression of an inward experience. In view of this the content of the water is an irrelevance. MATTHEW F. ELSE (Minister) Grace Baptist Church Peel.